I‘m always worried about the private information I have online. Maybe this is because I have been hacking for a long time, and I know everything can be hacked. This makes me a bit paranoid. I have never trusted web sites to keep my private information safe, and nowadays it is impossible to not have private information published on the web, such as a social media web site. Sooner or later you could get hacked, this is a fact. Currently, many web and mobile applications give users the option to sign in using their Twitter or Facebook account. Keeping in mind the fact that Twitter currently has 200 million active monthly users (http://en.wikipedia.org/wiki/Twitter), it makes a lot of sense for third-party applications to offer users an easy way to log in. Also, since applications can obtain a wealth of information from your Twitter or Facebook account, most of the time you do not even need to register. This is convenient, and it saves time signing into third-party applications using Twitter or Facebook. Every time I’m asked to sign in using Twitter or Facebook, my first thought is, “No way!” I don’t want to give access to my Twitter and Facebook accounts regardless of whether I have important information there or not. I always have an uneasy feeling about giving a third-party application access to my accounts due to the security implications. Last week I had a very interesting experience. The web page displayed above is similar to the previous web page (Image 1). However, it also says the application will be able to access your direct messages. Also, the blue button is different. It says “Authorize app” instead of “Sign in”. While playing with the application, I never saw this web page (image 2). I continued playing with the application for some time, viewing the functionality, logging in and out from the application and Twitter, and so on. After logging in to the application, I suddenly saw something strange. The application was displaying all of my Twitter direct messages. This was a huge and scary surprise. I wondered how this was possible. How had the application bypassed Twitter’s security restrictions? I needed to know the answer. My surprise didn’t end here. I went to https://twitter.com/settings/applications to check the application settings. The page said “Permissions: read, write, and direct messages”. I couldn’t understand how this was possible, since I had never authorized the application to access my “private” direct messages. I realized that this was a huge security hole. I started to investigate how this could have happened. After some testing, I found that the application obtained access to my private direct messages when I signed in with Twitter for a second or third time. The first time I signed in with Twitter on the application, it only received read and write access permissions. 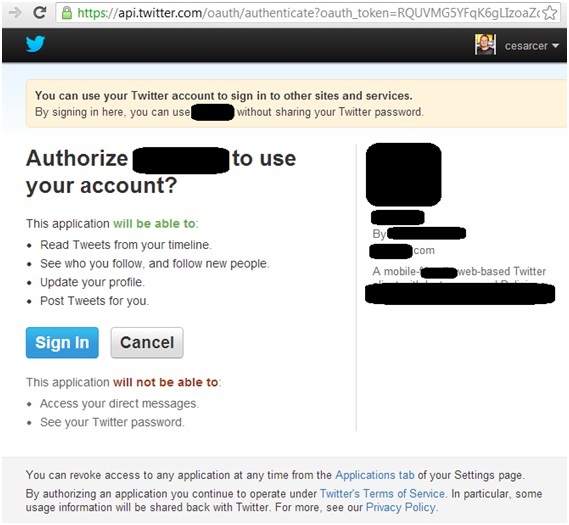 This gave the application access to what Twitter displays on its “Sign in with Twitter” web page (see image 1). Later, however, when I signed in again with Twitter without being already logged in to Twitter (not having an active Twitter session – you have to enter your Twitter username and password), the application obtained access to my private direct messages. It did so without having authorization, and Twitter did not display any messages about this. It was a simple bypass trick for third-party applications to obtain access to a user’s Twitter direct messages. In order for a third-party application to obtain access to Twitter direct messages, it first has to be registered and have its direct message access level configured here: https://dev.twitter.com/apps. This was the case for the application I was testing. 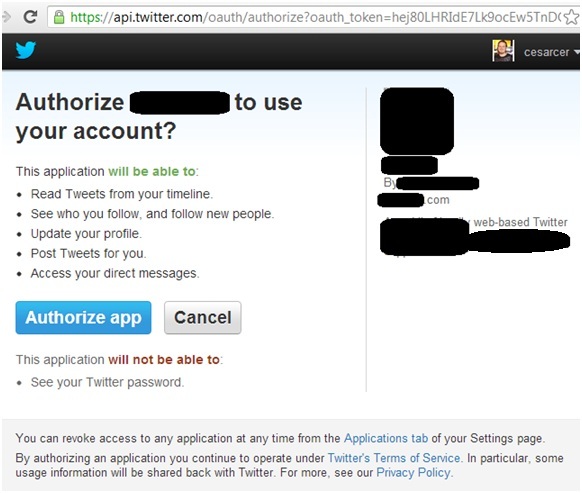 In addition and more importantly, the application has to obtain authorization on the Twitter web page (see Image 2) to access direct messages. In my case, it never got this. I never authorized the application, and I did not encounter a web page requesting my authorization to give the application access to my private direct messages. I tried to quickly determine the root cause, although I had little time. However, I could not determine this. I therefore decided to report the vulnerability to Twitter and let them do a deeper investigation. The Twitter security team quickly answered and took care of the issue, fixing it within 24 hours. This was impressive. Their team was very fast and responsive. They said the issue occurred due to complex code and incorrect assumptions and validations. While I think the Twitter security team is great, I do not think the same of the Twitter vulnerability disclosure policy. The vulnerability was fixed on January 17, 2013, but Twitter has not issued any alerts/advisories notifying users. There should be millions of Twitter users (remember Twitter has 200 million active users) that have signed in with Twitter into third-party applications. Some of these applications might have gained access to and might still have access to Twitter users private direct messages (after the security fix the application I tested still had access to direct messages until I revoked it). If you see an application that has access to your direct messages and you never authorized it, then revoke it immediately. I love Twitter. I use it daily. However, I think Twitter still needs a bit of improvement, especially when it comes to alerting its users about security issues when privacy is affected.